Sri Lanka has rejuvenated a crucial export mechanism using more than 400 top private sector personnel to man the direction of its export sectors and sub sectors. It also kicked-off the next biggest event in the country's export calendar, the Expo 2014. "Export sector contributes 17% to the GDP. However, this sector has become more and more challenging for us. Therefore it is now time that we enhance our on-going market and product diversification even further. About 54% of our exports are still concentrated on EU and NAFTA markets" Rishad Bathiudeen, Minister of Industry and Commerce said . inister Bathiudeen was addressing the soft launch of Expo 2014 and appointment of members to the 26 Advisory Committees under the EDB event held at Kingsbury Hotel, Colombo on 11 July. The Government considers that the private-public cooperation is important not only for formulation of successful export development strategies but also in implementing such strategies." "Within this framework, the 26 Product Advisory Committees manned by more than 400 top private sector nominees, shall implement the plans for each specific export sector within overall exports schema." "The second in the revived international export fair in Colombo, Expo 2014 has now been tentatively scheduled for August 2014. The previous, revived fair being Expo 2012." 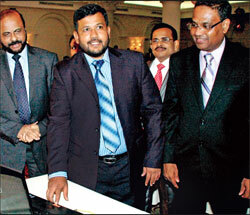 "Today is an important day in Sri Lanka's exports sector. We are appointing the Advisory Committees of Sri Lanka's premier national exports organization, the EDB, and also launching the next international mega event in our exports calendar which is the 'EXPO 2014" said Minister Bathiudeen, and added: "The global markets continue to show changing demand patterns, not only due to the recent global economic crisis but also as a result of long term fundamental changes in overall global consumption and shifting world market patterns. For example, 66% of the world market and population growth in the next century is expected to come from Africa. The rapid growth in China's household consumption and their growing use of raw material has enabled it to become a major destination for our exports. In fact, the BRICS grouping is a promising new destination, for us." "Therefore it is now time, that we enhance, our on-going market, and product diversification efforts, even further. About 54% of our exports are still concentrated, on EU and NAFTA markets. Also, I believe that there are two segments with strong potential to become export growth drivers in the coming years. These two segments are our high tech exports and export of services and they need even closer attention when formulating our future export strategies." "Even though our high tech and value added exports are only 1.5% of total exports, recent budgetary measures to upgrade our research and development infrastructure with the cooperation of private sector, is a positive step in this regard. I am confident that the advisory committees appointed today, shall take these factors into consideration." "Our export sector after witnessing, two years of rapid growth in 2010 and 2011 experienced a setback in 2012 similar to many other countries in the region." Last year's Expo 2012 international event in Colombo has opened many new export opportunities, for our exporters. For the first time, visiting international buyers clearly saw that Sri Lanka's capacity in supplying a much diversified basket of products. The next event in this international series is 'Expo 2014', and we are keenly looking forward to new doors of opportunities that could open for us in this, as well as the forthcoming CHOGM trade fair in November in Colombo. We kindly request your valuable support in these international efforts." Bandual Egodage, Chairman of EDB, addressing the event, said: "Setting up this Advisory Committee is a statutory requirement. This is one of the biggest advisory committees to be appointed under any single institution in Sri Lanka, with almost 400 brains in just one committee. I urge the fullest cooperation of the 400 members for us to get out of this export slump situation."